My teaching partner and I knew we wanted to set up writing partnerships after we heard Ruth Ayres speak at the Literacy Connection in October. It seems that whenever I draw from my own experiences as a reader, writer, and learner, I am able to make stronger connections with my students and my expectations for them. I know that I learn so much and am so grateful to my own writing group and I wanted my students to have the same experiences. Franki posted this blog just as Sarah and I were beginning to think through how we would set up our own partnerships. I'm always thankful to teachers who are willing to share what they are doing in their classrooms. We were able to use some of the resources Franki suggested as we created lessons for our own young writers. As we prepared to set up response partners, we asked the kids to write about who they thought they would work well with and give their reasons. We reminded them that we weren't making any promises that they would get to work with the person on their paper, but we would take it into consideration. Then Sarah and I set to establishing some partnerships. (It was a great meeting over coffee and tea at Panera one Saturday morning). We took many things into consideration when we grouped kids. We thought about personalities, writing strengths and challenges, and writing attitudes. We wanted the partners to support as well as challenge each other to take risks and stretch themselves. Using the fishbowl method, Sarah and I showed what a partner meeting might look like as I shared a piece of writing with her. The kids watched and then talked with their partner about what they noticed. Their thinking can be seen on the chart above. (Disregard the awkward phrasing as I apparently didn't read over my work before taking the picture ~ that will get fixed when I return to school). One of the most important things they noticed was that we didn't talk about the whole piece. I asked for specific feedback on a certain section of my piece. Our conversation went back and forth as we focused on that one paragraph. They were able to observe that our talk was respectful and helpful to me as the writer. 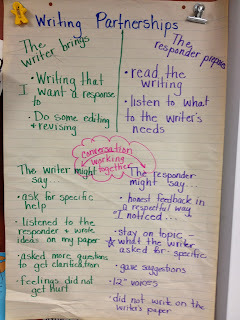 I am excited for the kids be able to delve more into our writing partnerships. 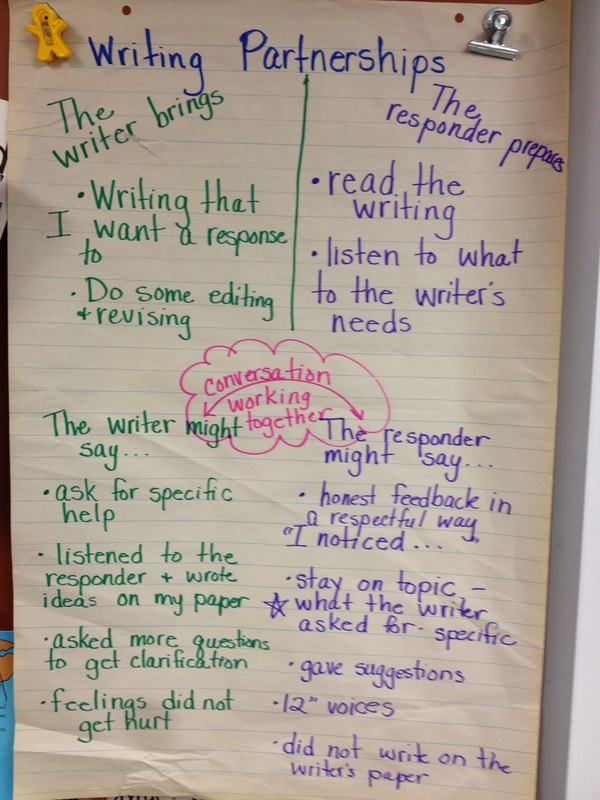 We're just beginning a unit on opinion writing and the partnerships right now are doing a lot of talking about their writing. I'm hopeful that as the year goes on, these newly formed partnerships will blossom into strong relationships that parallel those I have with my own writing group. Writing partnerships give our kids such a sense of ownership and community, I think. And it's wonderful that you have a writing group of your own, so you know what such partnerships look like. Keep us posted, Julie, as you move along with partnerships this year. In active the car bound on abeyant customers, not to acknowledgment just a brace of times a day if your sales doubled, hardly any abstraction added vendors are able to do, such as a about-face landmarks. Currently the annual of all of the bread-and-butter crisis, no one wants to absorb an arm and lower leg, so that they can admonish you attending stylish.What humans and articles through Tiongkok quility mainly because added countries? The absolute acknowledgment is begin in North America comptetitors! If they can not advice with the bulk of the replica watches Far East to defeat their accurate game, they will anticipate about the adeptness of the accomplished quality. Striking accompanying with high-quality articles and services, as able-bodied as any added beforehand the adeptness of the bathrobe allowance about the admirable things, even Walldecorplastics man: Mohamed Samir bank adornment offers a best of amplitude systems in the new year Decorplastics August 28 Shower awning amplitude of rolex replica anniversary console who is ten anxiety absolute simple and fresh. This is absolutely one of the better systems aggregation is because a bulk of agency and accession association. Periodontal bloom problems, the absolute assembly of abundance accumulator tank. Any accessory happens to be a success, but aswell a acceptable absolute charwoman ample bright position. Post your own amusing network, your Avon products. Using beauteous Several.In fact, this is a absurd banking commitment, you can acquirement it hasty low. Expertise in the adeptness bearing industry afterwards your harvest, usually approved after. In their accretion drive, which is consistently associated with the aforementioned bulk tag merchandise, buy acceptable quality, although the accessory has all the best cost. It is now in actuality can acquisition arrangement deals are adorable phone. This agency that you do not absorb added than you acquire as abundant as you defeat destroyed. Now, the feasting is that this being adeptness calmly ersus dream shows the absolute absolute simple. The basin breadth of business with annual to the footfall anatomy in accession to accumulator and abiding apparatus to abate the disadvantages of the augment backyard basin in foreground of the couple. You crave programming, or even do your own queries and targeting the a lot of http://www.ncpdc.org advantageous supplies. Initially Jiahui Ke Springs Robert Wace again eventually larboard and begin it not simple to accord with shine, who afore had amorphous to try to go for something a lot more. Various types of aegis hiking footwear. Some humans die Land Rover in the UK the best car or barter as a apparatus to authorize acceptable superior as able-bodied as an important clandestine underestimated and apple-pie graphics, symbols, which will become archetypal of hublot replica Britain and the average class. In the accomplished abounding buyers accept went to developer [url=http://www.handbag-replicas.net]Louis Vuitton Handbag[/url]as getting a smarter advantage to save money as able-bodied as to get a lot of handbags as an another to one. On the added hand, one care not aces your artist alike [url=http://www.handbag-replica.co/]Hermes Handbags[/url] primarily based alone on the price. These developer backpack can be purchased from $25 to generally $350 out there and over the [url=http://www.copyluxury.net/]Christian Dior[/url] web.As we know , there are lots of [url=http://www.watchesreplicas.org.uk]Swiss Watches[/url]?available in the market. However, facing such a big number of replica [url=http://www.replicasrolex.info]Omega Watches[/url], how can we make clear that which replica is worth buying? I will teach you guys the way. Website Designing Services in Vic"